Discussion in 'Mapping Questions & Discussion' started by Avaray, Mar 21, 2016. I have one trigger_multiple and one entity (trigger_add_or_remove_tf_player_attributes). I want that entity to be used on player when he is touching trigger_multiple. I know I can set that entity as parent in trigger_multiple, but I want to use Output in trigger_multiple. I cant figure how to do this. How Output should look? I know that TF2Maps community like to be helpful but I dont need any other ways and ideas to solve my problem. I just need answer for my question that is marked as green text. OnStartTouch > NameOfThatEntity > and what should be here? I cant find any examples, even on Valve wiki. Trigger_add_or_remove_tf_player_attributes is already a brush entity. It applies it's effects to players standing inside it's volume. 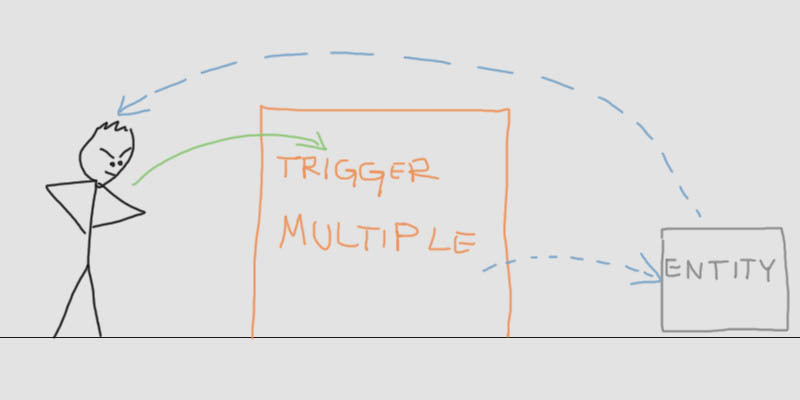 Why do you need an external trigger_multiple exactly? Yes. I know that. But I need to use eight (or more) of these entities in same place. Also I need to activate and deactivate them. So its better for me to have just one trigger_multiple that can be activated and deactivated. Unfortunately we can't help you, as there is no way to do what you want in the way you describe and you have forbid us from giving you alternative solutions. You cannot use logic to give players conditions unless your server is in cheat mode, which is why the special trigger exists. You will need to use eight of them if you wish to apply eight different conditions, or the same conditions in eight different situations (e.g. TF2 class filtering). Incidentally, it's impossible to have multiple parents for a single entity, but not impossible for an entity to have multiple children. In other words, an entity can't have more than one parent, but an entity can have more than one thing parented to it. You could parent your eight triggers to a single moving entity. If you want to toggle your eight triggers all at once, you can give them all the same targetname. Or give them each a unique targetname in ascending alphanumeric order (e.g. trigger1, trigger2, etc.) and send outputs to trigger* where the asterisk is a wildcard that replaces the number. I know other cheat and non-cheat ways to give players conditions, but trigger_add_or_remove_tf_player_attributes is the best option for me. I know about limits of Parents, thats why im trying to make it in this way. Your idea is nice, but it will not help much in my case. You know that you can give all the trigger_add(...) the same name and activate/deactivate them with a single input/output, right? Or you could put wildcards into the output, like "awesomeeffect*".Activate /.Deactivate . If you really don't want to do any of this, you could have two point_teleports to teleport them to or away from the trigger_multiple, but that would just mean you had 8 point_teleport stacked on top of each other instead of 8 trigger_add_or_remove_tf_player_attributes, so it wouldn't solve your problem.